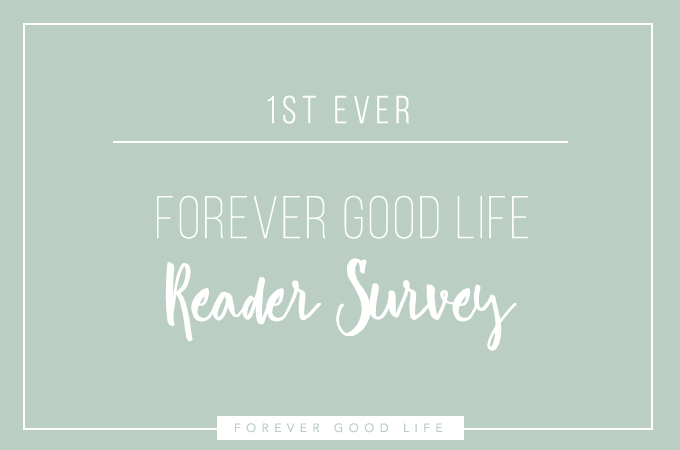 It’s time for the very first ForeverGoodLife Reader Survey! I’m pretty bad of asking for help, but today I’m reaching out hoping you’ll help me out. To get to know you and what you’re looking for I’m doing this survey. The survey will be open for the month of May (1st to 31st of May) and takes maybe five to ten minutes to go through. This survey is 100% anonymous. Not even I will know who the answers came from. Maybe this will become an annual thing, at this point I don’t know. What I do know is that I would so, so much appreciate you if you could take a few minutes out of you day to answer these questions. Thank you for helping me continue creating content that serve your needs. Click here to open the survey.